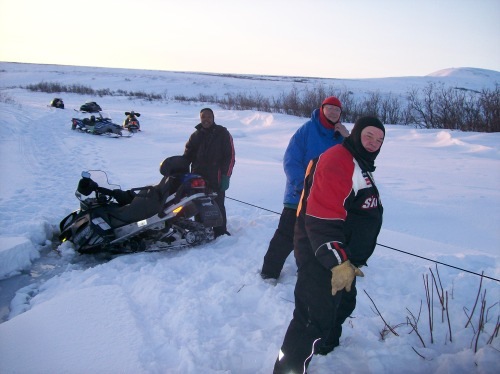 This was a beautiful trip from Nome, to Cape Nome, and hence to Nook, where we stopped for a break at Dr. Leedy's cabin. Well rested we travelled north across Safety Lagoon and up the east foothills of the Eldorado River country. In due time we arrived at Pajara Creek, where we played the Let's see who gets stuck first game before heading back. (Above) Clinton's new GTX decided to meet some Chinamen. That watery hole leads to China. It was not without incident, that dent in the front turned out to be an $800 fix! Location: Eldorado River, aprox 20 miles east of Nome. (Above) Clinton's machine has been partly pulled out with the aid of a long rope and a Spanish Windlass. Now the heels of the skis are caught under the ice. Location: Eldorado River, 20 mi East of Nome. The people involved were Keith Andrews, not shown as he took the pictures, Clinton ... the smiley guy next to his GTX, Dr. Leedy with the blue jacket, Lance Johnson wearing a helmet (he never took it off!) and Ramon with the balaclava and bellied out Red/Black jacket. Subsequent to these pictures we also tied another rope to the ski tips, pulled the front up and forward, easing the rear rope and over the ice in front of the machine. 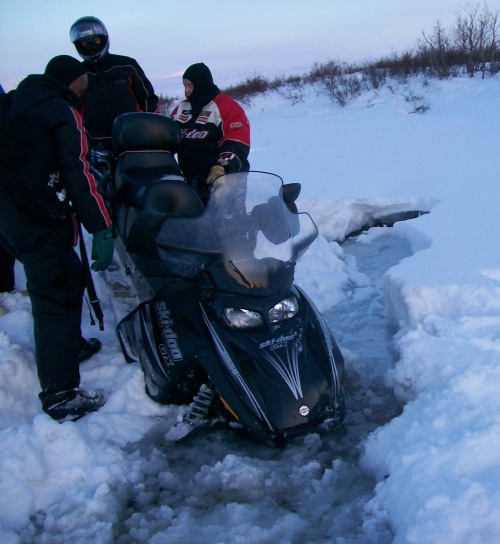 The machine was driveable, but had some serious damage which was subsequently repaired by Wilderness SkiDoo in Nome. Total Trip Mileage: 74 miles.